One of my favourite things about the neighbourhood we live in here in Brisbane, is the farmers market that sits right on our doorstep on Saturday mornings. When living in London, the desire to buy the weekly shop at a market was greatly outweighed by the necessary 30+ min journey just to get to one. Here however, between 6am to 2pm each week I can walk 200m from our building to Davies Park, grab an excellent coffee (I mean, the coffee is excellent everywhere here) and get my fruit, veggies, meat, fish and eggs all for the equivalent of around £50. To put that into perspective, it works out to about half of what I was spending per week back in Blighty. 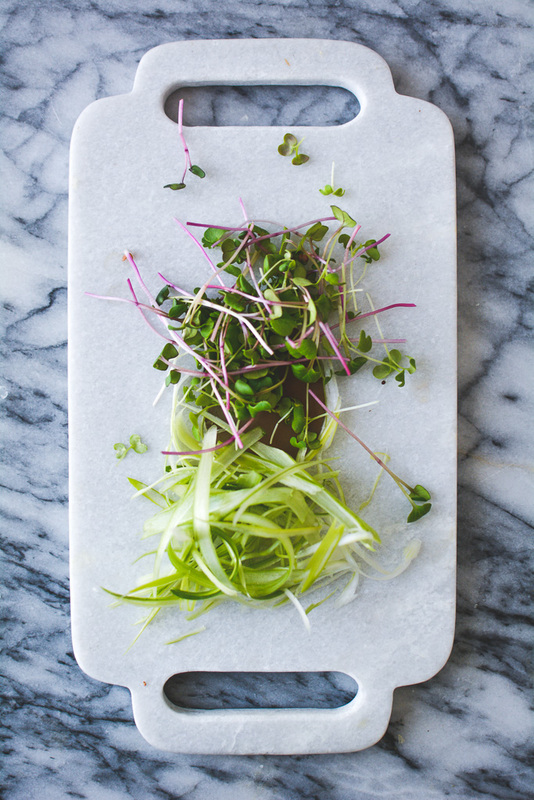 So as you may have guessed it, this delightful side dish came about as a result of a recent market haul. I grabbed a beautiful bunch of carrots - tops and all - with the intent of simply roasting them. But looking at those tops I thought there’s got to be a way of utilising them, instead of them going to waste. A fiend for pesto shall always be just that, and I quickly blitzed those leafy greens up together with the necessary ingredients that I seem to always have on hand (pine nuts, garlic, olive oil and of course parmesan) while those multicoloured carrots were roasting to sweet perfection. This recipe makes enough pesto to use another time - try stirring whatever you have left through pasta, topped on eggs or as a base for your next sandwich. While the carrots are roasting, get to work on the pesto. In a blender add the carrot tops, garlic cloves, pine nuts, a pinch of salt and the remaining 8 tablespoons olive oil and blitz until combined. Transfer the pesto to a bowl and stir in the grated parmesan. Add more salt as needed, and an extra glug of olive oil if you see fit. 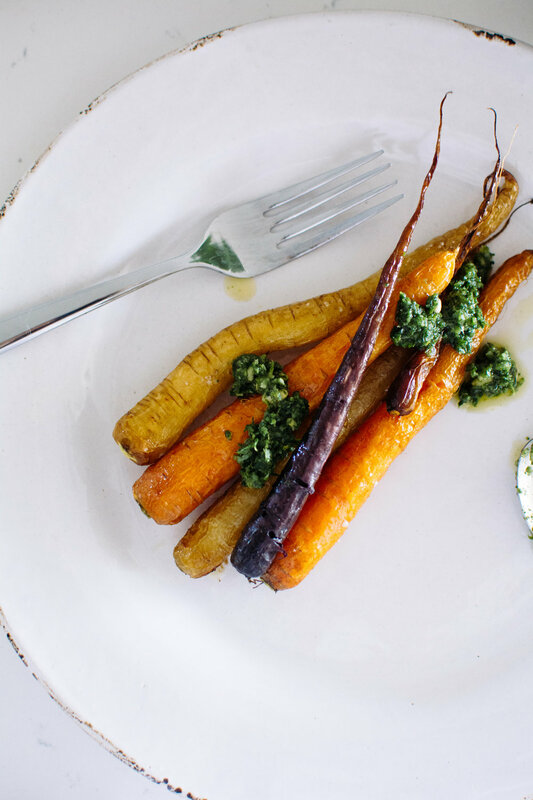 Once the carrots are roasted, serve with a few dollops of pesto. So... hi. It's been over two years (!!) since my last post, possibly the longest hiatus from a blog the world has ever known. Truth be told, a lot has happened. When my mum was diagnosed with terminal cancer in May 2016 everything changed, and by November that year I left my job to look after her - simultaneously the easiest and most difficult decision I have ever made. In short, it was the most painful time of my life and everything took a backseat while I navigated through heartache and grief - including this blog. Fast forward to today - a little over a year since she passed away - and I feel like I'm slowly coming out of the fog and starting to pick things back up. A conversation with a friend asking me about whether or not I'd update this blog again prompted me to post this - something a little fun on a sunny, chilled out Sunday. This is my dream food on a plate, a combination of all the good fats, protein, nutty brown rice and a mash up of flavours - plus it's pretty healthy too. I like to hit the salmon at a high temp for a short amount of time so it's just cooked through with a nice finish on the outside. Add as many or few components as you like - avo and a pop of pickled cabbage work a treat for me. 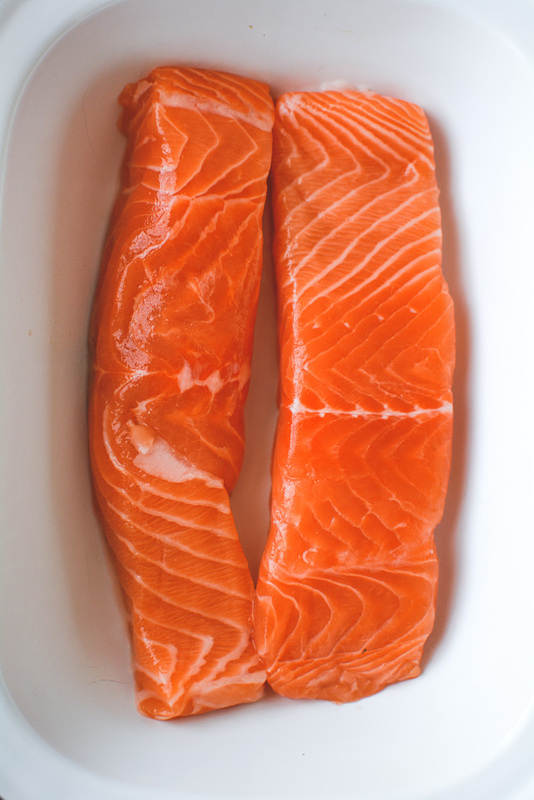 Mix together the miso paste, maple syrup and orange juice and pour over the salmon fillets - leave to marinate for as long as you can spare. Transfer the fillets to a baking tray and cook in the centre of your oven for 15-16 minutes. Meanwhile, toss the rice with soy sauce, rice wine vinegar, sesame oil, almonds and sesame seeds and season to taste with a little salt if required. 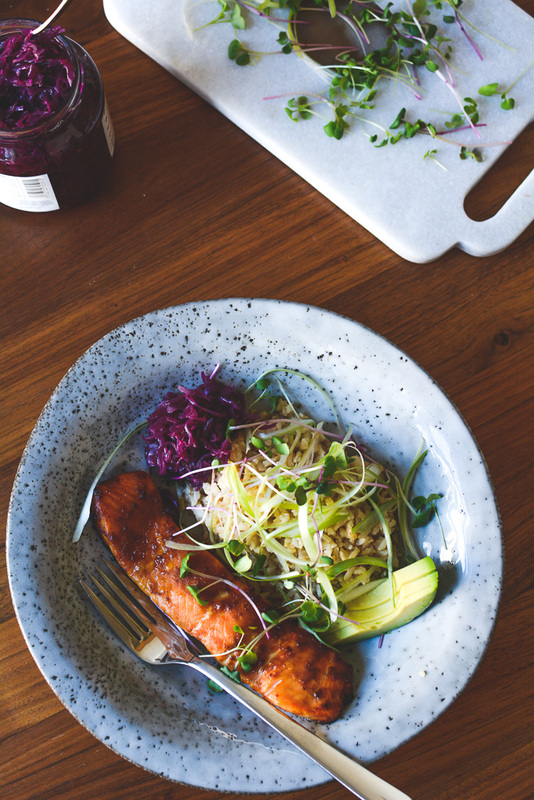 Plate the salmon alongside the rice, top with the peeled scallions, micro greens (if using), a side of avo and a heaped tablespoon of pickled cabbage.